« Straight Lines Only Please!! …. This week’s challenge is the first of the month, which means it is a UMT challenge. (UMT stands for “Use My Tangle”) From those submitted to her, Laura selects a tangle to be used on the tiles. This month’s UMT challenge features Mezzanine by Heidi Sue. 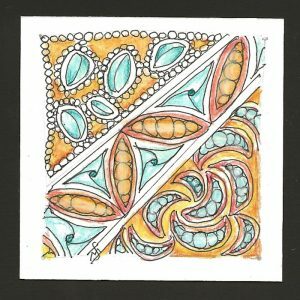 This is a new tangle for me and I had to draw it a few times in my sketchbook before using it on a tile. I decided to do it on a Bijou tile as a monotangle. 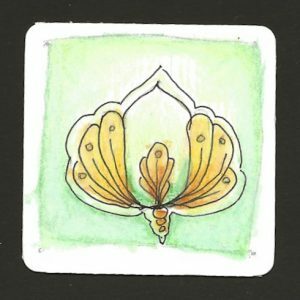 I was away last week and did not have access to a scanner so I am posting my tile for that challenge this week. Last week’s challenge was to include tangles that use orbs. The first tangle I thought of was my tangle, Orb Pods. Then I had to decide which of the many tangles with orbs to put with it. I, like Laura, love drawing orbs and will most likely do this challenge again in the future. I used a 3″ tile for this challenge. Your bijou is very pretty and the simple presentation of just one motif is very effective. I love your orbs tile, especially with the little bit of colour. That Mezzanine is like a sweet little flower in the springtime! And I love your Orbs challenge piece. Looking like a garden!